Lady Gaga is an American singer, songwriter, and actress. She is known for her eccentric fashion and clothing. She is the daughter of Cynthia Louise (Bissett) and Joseph Anthony Germanotta. She is of three quarters Italian descent (through her father and maternal grandmother). Lady Gaga’s maternal grandfather was of French-Canadian/French, English, German, Scottish, and remote Swedish, Irish, and Dutch, ancestry. Lady Gaga has pointed out similarities she shares with pop idol Madonna, including being of heavily Italian origin, starting out in the New York underground scene, and becoming famous when dying their hair blonde. Lady Gaga’s patrilineal ancestry can be traced back to her fifth great-grandfather, Giovanni Germanotta, and to his wife Antonia Leonetto. 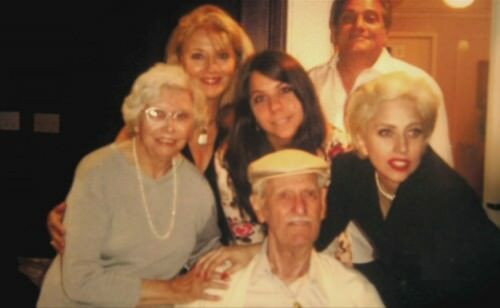 Lady Gaga’s paternal grandfather was Joseph/Giuseppe Anthony Germanotta (the son of Antonino “Anthony” Germanotta and Rosaria “Rose” Lipari or Galipo). Joseph was born in New Jersey. Antonino, a shoemaker, was born, c. 1881, in Naso, Province of Messina, Sicily, Italy, and was the son of Francesco Germanotta and Rosaria Guerriero/Gumina. He moved to the U.S. in 1904 with Lady Gaga’s great-grandmother Rosaria, who was also born in Naso. Rosaria was a peasant, who was the daughter of Antonio Lipiari/Lipari and Benedetta Merendino. Lady Gaga’s paternal grandmother is named Angelina/Angeline C. Calderone. Angelina is of Italian descent. Lady Gaga has used the male alias Jo Calderone, after her grandmother’s name. Lady Gaga’s maternal grandfather was Paul Douglas Bissett (the son of George Lindsey/Linsey Bissett and Sarah Ann “Sally” Leach). Paul was born in West Virginia, and had French-Canadian/French, English, German, Scottish, and remote Swedish, Irish, and Dutch, ancestry. George was the son of John Bissett and Wilhelmina “Minnie” Burghardt. Sarah was the daughter of John Lewis/Lee Leach and Georgianna/Georgeann W. Morningstar. Lady Gaga’s maternal grandmother is Veronica Rose Ferrie/Ferri (the daughter of Vincenzo/Giacomo “James” Ferri/Ferrie and Filomena/Fleminia G. “Minnie”/”Fannie” Campagna/Campana/Cambangnia). Veronica was born in West Virginia, to Italian parents, from Brocco, Province of Caserta, Campania, now Broccostella, Province of Frosinone, Lazio. Filomena was the daughter of Giovanni/John Campagna. Her grandmothers are still living.